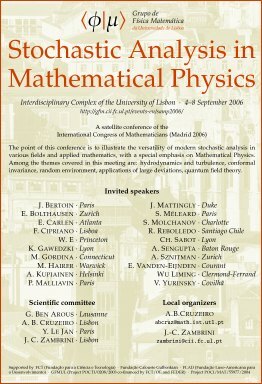 International Congress of Mathematicians (ICM2006). The Group of Mathematical Physics organizes a Conference on Stochastic Analysis in Mathematical Physics in the Complexo Interdisciplinar of the University of Lisbon. Scientific Committee: G. Ben Arous (Lausanne), A. B. Cruzeiro (Lisbon), Y. Le Jan (Paris), J. C. Zambrini (Lisbon).